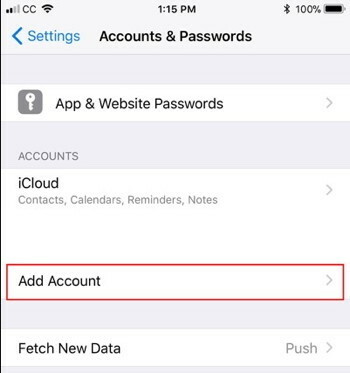 Change or correct the settings in an already existing account (Change iOS). For example, if an email password has been changed click on Change Settings… from the Table of Contents and follow the documentation to find the password update sections. 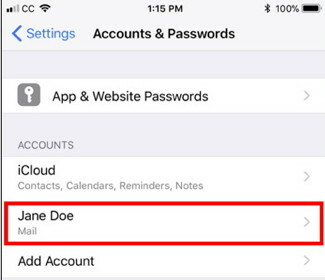 The following steps provide guidance for setting up an email account for the first time, or setting up additional email accounts. 1. Select Settings from the Home screen, then touch the arrow to the right of Passwords & Accounts from the options. 2. Scroll down and touch Add Account. 3. Click Other from the list of options. 4. Click Add Mail Account. 5. Enter your name, email address, and password, then click Next in the upper right corner. 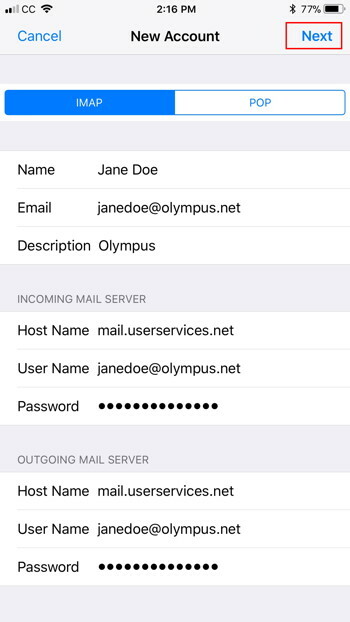 If you plan to add more than one OlympusNet account, use the email address for the Description field, or (for example) janedoe Olympus, so accounts can be distinguished one from another. 6. Enter the other details. Both incoming and outgoing mail server host names are the same. 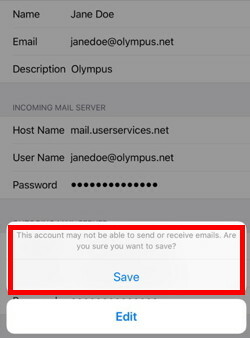 The screenshot example below shows an olympus.net email account. 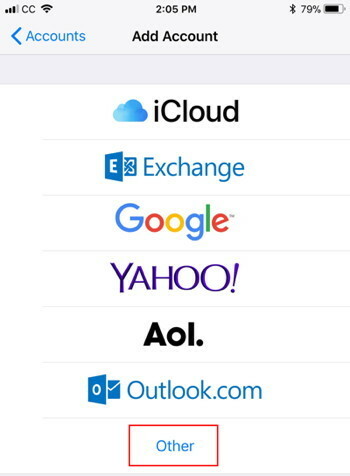 IMAP is best used for iPads, all phones and tablets. 7. If you get an error (see below) check your details for typos. 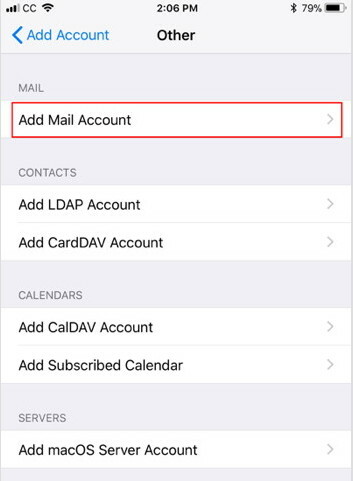 If the password needs to be retyped, remember to type it in both Incoming and Outgoing Mail Server fields. The error might also arise if the device is not connected to the internet at the moment. Click Save if you’re not connected to the WiFi and have to edit later, so you don’t have to start from scratch. 8. After any edit, click Next in the upper right corner. The account will Verify again. If there is no error, the account should be ready to go. Go back to Home and touch the Mail icon to test. 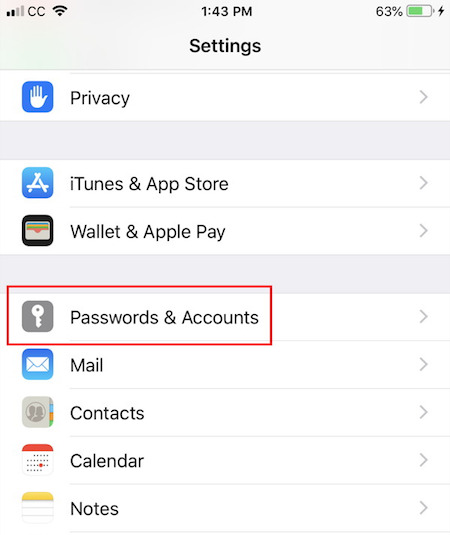 The following steps provide guidance for changing settings in an email account that is already set up; for example, an email password change. 1. Select Settings from the Home screen, and touch Passwords & Accounts from the options. 2. To add additional account(s), click Add Account and return to the top of this document for the setup details. 3. 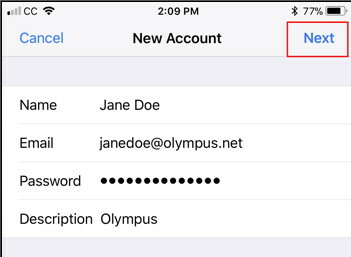 To edit an existing account, scroll down to the Accounts section and touch the arrow to the right of the OlympusNet Mail account. 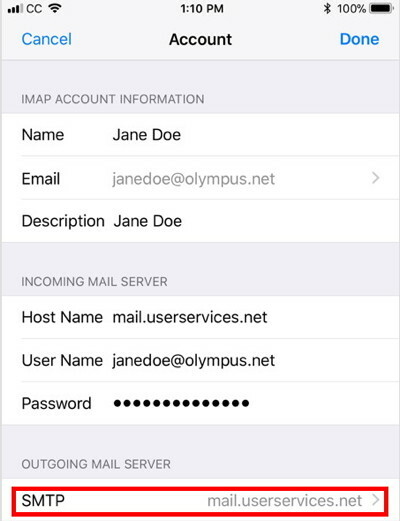 It may show your name, or IMAP, or Olympus, depending on the Description entered originally. 4. 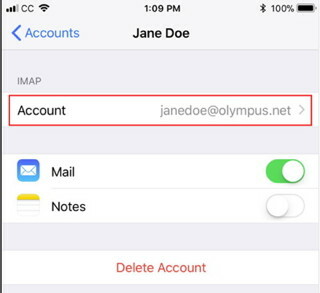 Under IMAP, touch the arrow to the right of the email address (janedoe@olympus.net in the screenshot). 5. For a password change, there are two places to change the password. 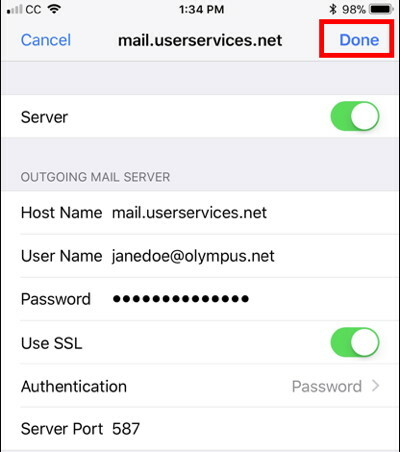 Scroll through the settings for Incoming Mail Server, remove the dots in the first password field and type in the new one. Click Save in the upper-right corner to save the change for the incoming server. 6. When the page refreshes, you will be back at the screenshot on Step 4. Touch your email address. 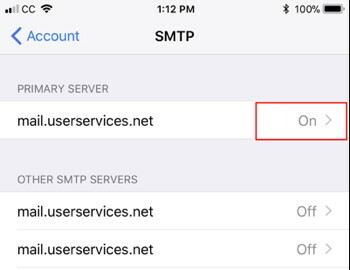 Then scroll down to Outgoing Mail Server and touch the arrow to the right of SMTP, server name. 7. Under Primary Server, to the right of mail.userservices.net, touch the arrow to the right of On. 8. Take out the dots in the password field and enter the new password. The other settings should be: Use SSL, green for on. Authentication should show the word Password to the side (if it does not, click on the arrow to the right, and click the word Password from the options. The Server Port is 587. Click Done in the upper right corner.